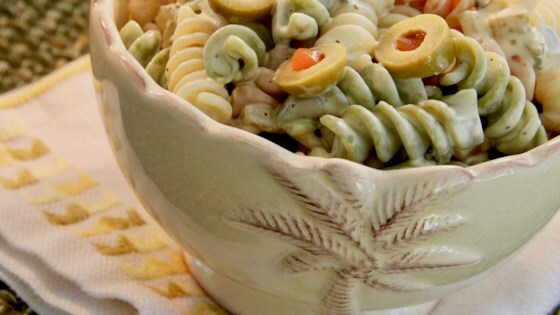 "This is a tangy pasta salad that is quick to make and tasty to eat. It's great as a side dish or a light meal. I first made this for my husband and myself because it was too hot in our apartment to cook for any length of time and too hot to want a hot meal!" Bring a large pot of lightly salted water to a boil; cook the rotini at a boil until tender yet firm to the bite, about 8 minutes; drain. Rinse in cold water until rotini are cold and place in a large bowl. While pasta cooks, mix mayonnaise, pickles, mustard, vinegar, sugar, pepper, celery salt, and garlic powder together in a bowl. Stir dressing into cold noodles until fully coated. Add additional pickle chunks to taste. Serve chilled. You can use whatever kind of pasta you have. You can always put the noodles in the freezer for a couple of minutes to cool them faster.